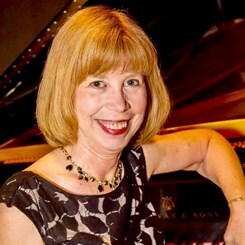 Catherine Burge holds the Doctorate of Musical Arts degree in Piano and Pedagogy from the University of Colorado. She has performed internationally as vocalist - piano accompanist and on keyboards with the Soldiers CHorus of the musical Ambassadors of the US ArmyField Band . Dr. Burge currently accepted a position to sing with St Louis Symphony as alto in the Chorus, and continues teaching piano and clarinet in Greenville as adjunct professor and collaborative pianist for Greenville University students and for the choral festival soloists. She teaches students in private lessons, studio classes or recitals as they strive to achieve the standards of virtuosity required for professional performance skills. Dr. Burge was chosen to work collaboratively with musicians of Greenville's Schoenhals symposium , including soprano Christine Brewer in 2018, Philadelphia composer Kile Smith in 2016 and St Louis Symphony trombonist Amanda Stewart in 2015. She also plays piano accompaniment or clarinet and sings each year for the Greenville concert featuring Handel's Messiah. Last year she held a special appointment as Assistant Professor of music to Briercrest College, where she rehearsed and grew the community orchestra, taught music history, theory and piano/clarinet lessons and held community performances with her keyboard improvisation students. Dr. Burge maintains a private music studio and performance business in Greenville where precollege students may elect to participate in the Illinois Achievement in Music Awards program or Southern Illinois Young Artist Soloist Organization. One student achieved the first superior rating for the state choral festival this year in voice performance She has served as adjudicator for these organizations, and has performed with the Rome Festival Opera Orchestra and as piano Soloist for Stolpersteine Verlegung events of Germany.She is contracted as the pianist/keyboardist for St Johns United Church of Christ, Mascoutah and performs with both Belleville Philharmonic and Centralia Philharmonic Orchestras. St Louis Wind Symphony.Last year she was chosen as the utility clarinetist for Regina Symphony; and played collaboratively with Regina Symphony musicians on chamber music recitals. Dr. Burge is a student of the Taubman/Golandsky approach to piano and instrumental technique, attending the Princeton University Institute each summer for 9 years, receiving an awards scholarship in 2016. She and her students have performed at the Yamaha Young Artist Institute and Steinway Piano Gallery in New York City with Edna Golandsky.